We've just started an experiment ... a month of the Failsafe Diet. Dotter's doctor suggested it, as Dotter has oral allergies to all fruits and many vegetables, which are also high in salicylates. Failsafe stands for Free of Additives, Low in Salicylates, Amines and Flavour Enhancers. Sue Dengate coined the term, for the low-chemical, low-reactive exclusion diet developed by the Allergy Unit at the Royal Prince Alfred Hospital in Sydney. There's increasing scientific evidence that this diet is very helpful for some people, so despite my usual scepticism, I'm willing to give it a try; it's often recommended for kids with ADHD, and in fact I gave it a (half-hearted) try about 12 years ago when Dotter was first diagnosed. We're trying it this time for some long-term treatment-resistant health problems - Hubby and I are doing it as well - it's such a bother to do, we may as well all go through it together. So, what does this entail? (Go here if you want to see the full description). Cabbage, Brussels sprouts, bamboo shoots, shallots, celery, leeks, chives, iceberg lettuce, white potatoes, swedes, green beans (limited amounts) - no tomatoes, people, no tomatoes! Fresh meats (not cured or smoked), eggs, fresh chicken, freshly caught fish, most dairy. Bread (if preservative and vinegar free). Legumes, grains, rice (not Basmati or Jasmine), pasta, cous cous etc, but no corn products. White sugar, soft brown sugar, golden syrup, maple syrup. Cashews, rice bubbles, oatmeal, WeetBix. 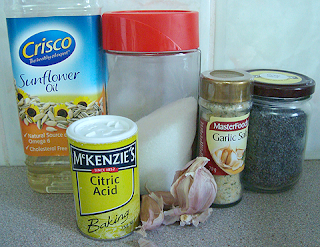 Citric acid, garlic (limited), salt, poppy seeds, saffron, garlic salt, parsley (limited). Sunflower or canola oil (no olive oil). No peppermint, so no toothpaste (we're using salt instead), and I've got Dotter low-allergenic shampoo, conditioner, shower wash, skin cream, and deodorant, and we'll use "sensitive" clothes detergent for a month too (as salicylates can be absorbed through the skin). There's a lot of cooking to do, as I need to make tons of things from scratch. Mayonnaise, hummus, pear jam, cashew butter, "magic lemon cordial" (sugar syrup with citric acid), chickpea snacks, and so on, in addition to dinners. I'm getting a lot of use from my food processor, and needing to cook several times a day to keep stocks up. One of the big things to avoid in bread is preservative 282, it's not possible to find commerical English Muffins without out (well, I haven't found any yet!). So I made some! It's a simple bread dough, made with milk. 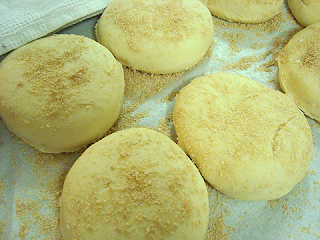 The dough rises once, and is then rolled out and rounds are cut out. The only adjustment I made to the recipe was to substitute the cornmeal coating with bran. After a second rising, sitting on baking paper with bran, they're cooked - in a fry pan! 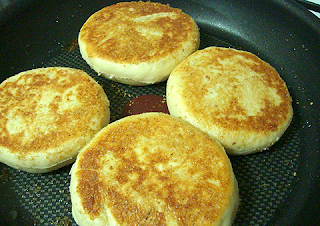 I had no idea English Muffins were fried ... just in a little oil, on low heat for about 7-8 minutes each side. And yes - toasted with butter - they taste bloody wonderful! 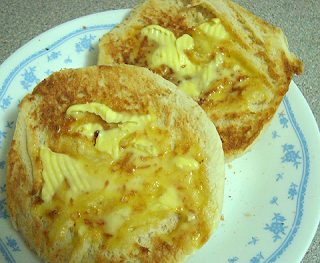 Wow - homemade english muffins - that would never have occurred to me! And I can't believe they are fried! Amazing. One of my nephews (who is 4) is allergic to just about everything - he can't even eat all the things on your list, let alone anything else. Very difficult for his mum to cook stuff for him, especially cakes etc. Hope the diet works for you all, that will help make it worth it! Thanks Rose Red :) I had to make English muffins as Dotter loves them, and was bemoaning not being able to have them ... anything for my girl! I'm sorry to hear about your nephew, food allergies really are so difficult to manage. It must be so frustrating for his mum. i've got an english muffin recipe I've longed to try. I think they must be amazing. Good luck with your special diet. I have had children in my class on that kind of diet. I have also heard Sue Dengate talk a lot on the ABC radio about her diet. Wow!! I didn't know they were fried either. I want to make some!!!! Oh good for you for finding a way to take control of the situation! Hang in fiercely and good things will occur. Sending you joyful mojo for the new foods. I'd have to clean out the spice closet because the temptation to add 'just a pinch' would be too much. I hope this goes well for you. Food plays such a vital part in our overall health. And I'd have the whole family do it too. It's too hard to have two sets of food. Awesome, homemade English muffins! That's something I'd love to try.